Recharge your Jio Prepaid and postpaid mobile for any plan i.e. Jio Recharge Rs 399 , Jio Top up using Amazon Pay balance, Paytm, mobikwik, PhonePe app and get cashback upto Rs. 100. 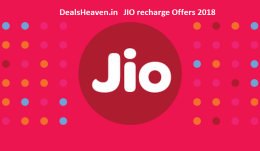 Below are the best recharge deals and offers for All type of Jio Recharge. Use Amazon pay balance and get upto 50% cashback on recharge of Jio prepaid and post paid mobile . Maximum cashback during this offer is Rs 50. Offer valid from Jan 01, 2018 to 31st Jan 2018 both days included. Get the cashback with in 3 days from recharge as Amazon Pay Balance. Cashback of Rs.15 is applicable only for recharge amount above Rs.300. Receive SuperCash of Rs.300 SuperCash on Jio Rs.399 plan on MobiKwik App. Promo Code can be redeemed only once per user. This is a limited period offers. The offer is applicable for New MobiKwik users on Jio prepaid operator only. SuperCash balance of minimum Rs 100 can be used.